When you have a bottomless supply of capital, you can put a perpetual bid under anything. When you can print money until someone forcibly stops you, you can hand out ZIRP cash to corporations, who then buy their own stock on the open market, propping up the market. If you had limitless Monopoly money, but only the fixed number of properties on the board to bid on, how much would you bid for good old $60 Baltic Avenue? That’s right. You’d bid infinity, because there is no limit to your ability to replace your capital reserves, for free. Welcome to the short run mechanism driving the American markets. I'd like to discuss the fourth quarter of 2008 vs. the first quarter of 2018. The two quarters in which the US undertook the greatest increases in federal debt but supposedly represent entirely different outcomes. 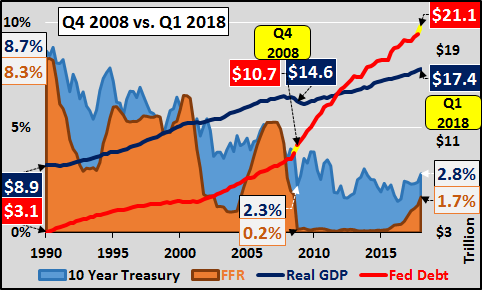 During Q4 of 2008, the US undertook $675 billion in federal debt, dropped the FFR essentially to zero, and saw the 10 year Treasury yield drop to 2.3% while real GDP fell by over $200 billion. 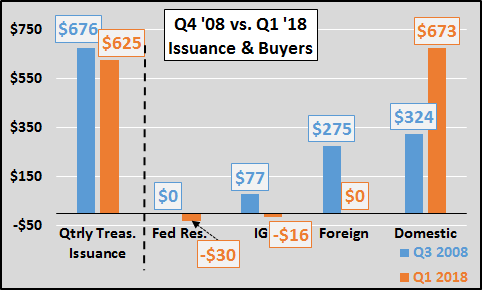 During Q1 of 2018, the US similarly undertook $625 billion in federal debt. But conversely in Q1 hiked the FFR to 1.7%, the 10 year yield rose to 2.8%, and Q1 real GDP likely rose around $125 billion. Since the completion of Q4 '08, Federal debt has risen 97% (+$10.4 trillion) while real GDP has risen 19% (+$2.8 trillion). Over this period, federal debt has consistently been rising 4x's faster than inflation adjusted economic activity...and as Q1 2018 highlighted, this trend isn't improving. But looking at Q4 '08 and Q1 '18 Treasury holdings (side by side), something very strange has taken place. In late 2008, as the financial and economic wheels were coming off and assets were abandoned for the comparative "safety" of Treasury's...the domestic public added a then record $324 billion in US debt to their holdings. However, in early 2018, as the stock market and housing markets were reaching euphoric highs...somehow the same domestic sources added a mind blowing approx. $750 billion in Treasury debt to their asset hoard?!? It is hard to believe all of this adds up to anything more than state level fraud. That America's ability to fund it's massive deficits via the Treasury market and manage the interest paid on that rapidly growing pile of debt are no longer dependent on market participants...but likely being enforced by the very pointy end of American "diplomacy".